Often we get customers coming in to buy replacement brake pads for their bikes. The best course of action in this case is to have your bike with you so that we can identify with 100% certainty that we're giving you the correct parts, but it does help to be familiar with what kind of brakes you have, so that in a pinch, you have an idea of how your brakes work and what kind of parts to look for. The most common type of brake found on most modern hybrid and mountain bikes is the linear-pull brake. These are sometimes called "V-brakes," although that name is actually trademarked by Shimano for their version of linear-pull brakes. These brakes have excellent stopping power, are easy to adjust, and have a quick-disconnect feature that makes it easy to clear the brake pads out of the way when installing or removing your wheel. 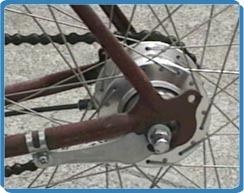 Linear-pull brakes are mounted using a set of posts that are built into the frame of the bicycle, one pair on the front fork, and the other pair on the rear seat stays. Cantilever brakes were common on older mountain bikes and hybrids, but are still commonly found on modern touring and cyclocross bikes. These brakes are distinguished by two roughly L-shaped calipers on either side of the rim, connected by the brake cable, which is pulled vertically away from the wheel. Cantilever brakes provide better mud clearance compared to linear-pull brakes. They are also easy to disconnect for wheel removal. The only downside to cantilever brakes is that they require an additional "cable stop" for the brake housing to pull against. This cable stop is sometimes provided as an integrated part of the bike's frame, but can also be an add-on bracket type of device. The mounting posts on the bike frame for cantilever brakes are the same as those used for linear-pull brakes. Linear-pull and cantilever brakes use the same style of brake pads. Sometimes, the brake pads have a smooth post that is held is place by a bolt that is part of the brake caliper; other times, the pad itself has a threaded post with a bolt on the end. So, whether you have linear-pull or cantilever brakes, you need to be careful to buy the brake pads that have the correct type of attachment post for your brakes. The most common type of brake on most modern racing-style road bikes are referred to as dual-pivot caliper brakes. These brakes have a compact "C" shape, with the brake cable that extends vertically from one side of the caliper. They usually have a small, rotating release lever that allows you to temporarily open the caliper for wheel installation and removal. The brake caliper mounts to the frame using a single bolt, either through the fork crown on the front, or through the seat stay bridge on the rear. Dual-pivot calipers are very easy to adjust and service. Their only downside is that they are only appropriate for very skinny-tired road bikes; they usually do not have enough clearance to accomodate wider touring tires. Disc brakes have become a popular option for mountain bikes in the past several years, and recently are starting to become more common on hybrids and some road touring bikes (such as the Raleigh '08 Sojourn). You would have expected to pay $1000 or more for a disc-brake equipped mountain bike a few years ago, but through trickle-down technology, very reliable models can be found on $350 mountain bikes today. Disc brakes provide the absolute best stopping power in all conditions, even in the rain or mud. The better models are easy to install and adjust, and replacement brake pads are readily available. The most common disc brakes use the same kind of steel cable as other brakes, although there are hydraulic disc brake models available on high end mountain bikes. The hydraulic models provide the best stopping power in extreme conditions, but do require a bit more technical expertise to install and adjust. Another nice feature of disc brakes is that you do not need to disconnect them in order to install or remove your wheel. The only possible disadvantage of disc brakes is that they require special hubs on your wheels for mounting the disc rotor, and mounting tabs on the bike's frame for the disc caliper. This is not a problem on a new bike, but could be an additional expense if you are looking to upgrade an existing bike to disc brakes. Side-pull Brakes are sometimes found on low-end department store-level bikes and BMX bikes. They have a very simple single-pivot mechanism, and also can usually use the same type of brake pads as linear-pull or cantilever brakes. One important point to note is that the hand levers used with each type of brake described above are NOT interchangeable. Each type of lever is designed to pull a specific amount of cable, in order to actuate the brake properly. Linear-pull brakes require a longer amount of cable movement, so they must be used with linear-pull-specific levers. Cantilever, dual-pivot, and U-brakes can use the same brake levers. Most mechanical disc brakes use the same kind of levers as linear-pull brakes, but some manufacturers have created road-bike-specific disc brakes that can use the same brake levers already found on most road bikes. Hydraulic disc brakes come as integrated brake and lever systems, where the lever is designed only to work with the corresponding model of brake. Of course, the old-fashioned "pedal-backwards" brake can still be found on one-speed cruiser-style bikes, and some multi-speed bikes that use an internally-geared hub. This brake is actually referred to as a coaster brake. A coaster brake-equipped bike can be identified by an L-shaped steel bracket that is bolted to the bike's frame and the left side of the rear hub. There are a few other older-style brakes that are very uncommon these days, such as center-pull brakes that have a similar mechanism to cantilever brakes, but attach with a single bolt more like dual-pivot calipers. For many years, tandem bikes were equipped with a powerful drum brake on at least one wheel. There was a rod brake system commonly used many years ago, but can still be found on some special-purpose bikes. Interesting article about brakes, definitely some correct information. I hope some people got some good use out of this!